The Sinn Féin leader was canvassing in Dublin Central this week. 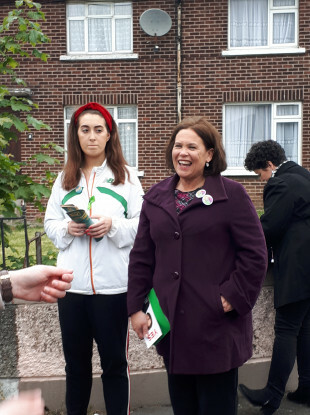 FRIDAY’S VOTE WON’T be won or lost in Mary Lou McDonald’s stronghold of Cabra, but the reaction of people there does show you the stead she is held in even by those on the fence. Four days out from referendum day and the Sinn Féin leader is going door-to-door in her home patch to shore up support. It’s an area that her team is confident of securing a Yes vote in but McDonald repeatedly tells supporters on the door that complacency is not an option. During a 90-minute dart around the housing estates near her Fassaugh Avenue constituency office, McDonald encounters an always receptive audience but one that is not universally on board with the government’s plans. Amid the shouts from boys of “G’wan Mary Lou!” and the girls in Communion dresses to be complimented, there is some business to attend to. One woman tells McDonald that she is “conflicted” over the issue and “will have to think about it hard before voting”. The woman explains that she finds the idea of abortion difficult to align with her religious beliefs but that she’s also influenced by her daughter and other female family members. “I don’t like killing babies but I have a girl here and she’s telling me: ‘I have a body and I can do what I want with it.’,” she says. McDonald listens and says it is a complicated topic but that she’s ”very, very, very sure” it’s the right thing to do, “both in public policy terms and legal terms”. “This is a real thing that happens to real women in the real world,” McDonald tells her. And as you know, we’ve a bad track record in terms of how we’ve treated women in this country. And one way to do it is to make it more real by thinking about your daughter, your granddaughter or whatever. The woman seems reassured and as McDonald leaves her she tells her that “even though she goes to Mass and everything” she will “probably vote Yes”. The TD is far from alone on the canvass, there are eleven others with her including two councillors, Janice Boylan and Séamas McGrattan. One of their member says they’ve come across many “silent Yeses”, people who will answer the door and tell you quietly their intention without wanting to expand on it. “I think it’s something that you’ve to approach with an appropriate level of sensitivity,” McDonald explains. The team moves on. McDonald is told there’s a woman who wants to speak to her. The elderly woman wants to show her something she received through the door. It’s a copy of a controversial booklet that was distributed throughout the country by pro-life group Save the 8th. The booklet says it is presenting “Information on the Government’s Proposals” and it unquestionably resembles what could be mistaken as a non-partisan official guide. The woman said she was initially confused by it but quickly realised that it was produced by the No side. “That is absolutely disgraceful,” McDonald says. The woman says she is a Yes voter and was angry she received the booklet as she felt it was “so deceptive”. McDonald moves on to a mother-of four who is now a definite Yes. Mandy says she wasn’t a Yes from the start but has come to the view that change is needed. She tells TheJournal.ie that there was a diagnosis of fatal foetal abnormality in her own extended family and even though in that case the woman chose to continue with the pregnancy she saw the devastation it caused. “I still detest abortion and don’t agree with abortion on demand by any means but if you don’t give a Yes vote then women aren’t going to get any kind of care,” she says. Mandy adds that she’d prefer if the 12 weeks proposal wasn’t included but that she “will have to be a Yes now”. As will be most people in the area, judging by a count taken by Maria Doherty. The long-time director of elections says that the canvass count is 66% Yes, 14% No and 18% unsure, with a few others saying they won’t vote. Doherty says the numbers are about the same as what they’ve been seeing in the area recently. She adds that those who say they’re unsure are likely Nos. “This is my read, it’s usually about 50-60% Yes, 20-25% No and 20-25% undecided. I feel the undecided has moved towards No, or they won’t vote. So turnout will be in the 50s,” she says confidently. On the road, McDonald speaks to a woman who stopped her car to tell the deputy about the problems her daughter has been having in finding housing. Another woman who came out with her dog to greet the canvass tells McDonald that she’s always been a supporter but that she’s never met her. She wants to speak about the time she met Gerry Adams and about her 98-year-old mother whom she cared for before she died last year. The two speak about caregivers and McDonald says the government “doesn’t invest in carers” even though it would be “the best money they’ll ever spend”. One passerby mistakes her for “Mary McAleese” but asks her to sign his petition to save a community hall in Finglas. McDonald lets him know he’s got the wrong Mary but signs the sheet regardless. It feels very much like a party leader meet-and-greet and McDonald says she’s been enjoying the campaign, even though it has meant listening to some “very harrowing stories”. McDonald however is adamant that this first campaign as Sinn Fein leader is not in any way “a practice run or a dry run” for a future general election. “These are totally decoupled in my mind,” she says. Despite this, there is no denying that McDonald’s face is up on posters, unlike the other main party leaders who are also campaigning for a Yes. This she says was a conscious decision by the party but was not about capitalising on any particular popularity she may be enjoying in the early stages of her leadership. One opinion poll over the weekend put Sinn Féin as more popular than Fianna Fáil. “This is possibly the biggest single issue question for women in particular, but for society, in a generation and leaders lead, that’s my view,” she says. The poster and my participation in it is about leading a debate that is about the issue. It’s about a crucial issue, not about playing for political advantage, we’ve been part of Together for Yes. We’ve worked collaboratively with others, people in politics and people beyond political life. Earlier that day, Leo Varadkar released a snazzy video in which he talked about his own view on the referendum. In it, the Taoiseach spoke about his journey towards his position, saying it had “changed over time”. For McDonald, she say there was no such evolution for her but that others around her have struggled with it. The conflict has affected some of the party’s base support and even some within its own ranks. Not far from McDonald’s constituency office, Sinn Féin referendum posters are hanging alongside others from pro-life group Cherish All the Children Equally. The group recently held a rally outside the GPO in Dublin in which their supporters claimed that the ideals of the Proclamation should extend to protecting the life of the unborn. Their posters featured images of 1916 leaders and members at the event were critical of Sinn Féin’s stances on abortion. Asked about that event, McDonald seemed puzzled by the comparison the group were making between 1916 and abortion but added that people struggle with the issue “for many reasons”. Neither does she feel that being against abortion is perhaps a traditional republican value. I don’t accept that it is a republican, or classically republic position not to take account of women and our welfare and out capacities as adult people. I don’t think that’s a republican value, I don’t think that the images of leaders of the Rising should be co-opted into this debate, that’s just a personal view. One of those who spoke at that GPO event was Sinn Féin TD Peadar Tóibín. The Meath West TD has been staunchly against Sinn Féin’s changing stance on abortion and last night appeared on RTÉ’s Prime Time debate arguing against it. McDonald says that while she would prefer that Tóibín was not canvassing for a No vote, he is doing so in a “personal capacity”. McDonald says there will be consequences for party members who vote against the party in the Dáil, as there was for Carol Nolan TD, but as yet it’s unclear what will happen with Tóibín. Speaking to TheJournal.ie, Tóibín would not state how he would vote if the referendum passes and abortion legislation comes before him in the Dáil, though he admitted it is a big “difficulty” for him. He said the question is a triple hypothetical – as in there are three different jumps that have to be made before the legislation is voted on. “It wouldn’t be logical for me to say what I would vote on in a bill given there are three different decisions to be made before that,” he said. Listen, I regret any difficulty I have created for the party on this issue. I know some party members are obviously unhappy with the fact I have articulated a strong view on this but for me if there is just one child under threat, never mind thousands over generations, if there is one child I would have no choice but to grab with both hands the chance to save that child’s life. “People have said to me, ‘well what if you lose your job over this’, and I said, it is not the end of the world if I lose my job, but if abortion comes in for the child, it is the end of the world. One child’s life is more important than my job, and every TDs job,” Tóibín added. Asked about this stance as the canvass comes to a conclusion, McDonald is clear that speaking is one thing but voting is another. Email “'G'wan Mary Lou!' - Sinn Féin's leader is a hit on the canvass but insists it's no election dry run”. Feedback on “'G'wan Mary Lou!' - Sinn Féin's leader is a hit on the canvass but insists it's no election dry run”.